As one of the most best-selling cable, the triplex cable with messenger has the perfect performance. The first is the insulation performance is good. Compared with the bare wire, it has the outstanding insulated performance. It can reduce the the distance from phase to phase of lines, and reduce the insulation requirement of the line supports. Meanwhile, it can increase the number of circuits on the same pole, and prevent from short circuit between phases by foreign objects. It will get less corrosion. Triplex cable with messenger has the insulated layer. It suffers less corrosion, and it can improve the service life. It also can simplify the tower structure. Triplex cable with messenger can not only save the line material, but also beautify the city streets. it is convenient for the high voltage to go deep into the load center, and reduce the power supply radius of low voltage line. Triplex cable with messenger can improve voltage quality. If you want to know more details, please leave you message, we will contact you as soon as possible. In addition, installing is conducive to urban construction and greening, and reduces the amount of pruning trees under the lines. Because the triplex cable with messenger is suitable to the densely populated area and growing faster place trees. Expect for these advantages, the triplex cable with messenger can save the space occupied by the overhead lines. It can cross the narrow paths, and reduces the corridor of lines. Because of the triplex is suitable for the narrow corridors. 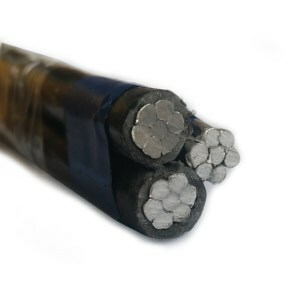 Because of the improvement of technical condition, triplex cable with messenger reduces the maintenance workload and prolongs the overhaul period. Meanwhile, it reduce the the time of blackout due to overhauling. Huadong Cable Group has the professional producing experience and the export experience, so choose huadong is choose good quality. Send the inquiry, we will reply you with the professional quote.